UPDATE May 8: New Venue to be determined. Doors open at 4PM. Show is 5-10PM. The UWS Festival tour will showcase music as well as panels of musicians, actors, writers, journalists, and other speakers discussing key issues such as: The Patriot Act, NDAA, NSA, war on drugs, drones, foreign policy/war, GMO, Internet freedom, election reform, honest media/music/art, central banks, corporatism, education/student leadership, the environment, spirituality/oneness, and more. The events will be recorded and broadcast globally. 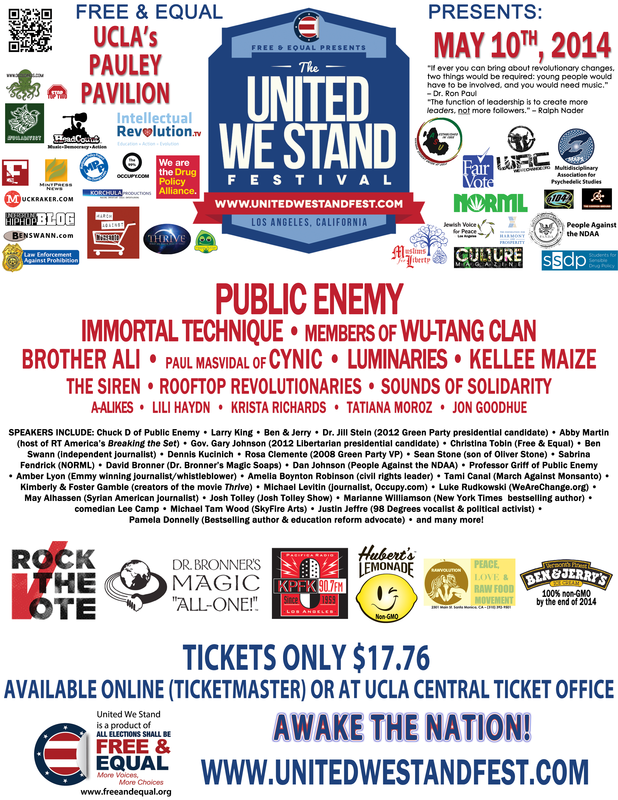 Our confirmed roster of musicians who support political and social activism includes: Public Enemy (Chuck D, DJ Lord and Professor Griff), Founders of Wu-Tang Clan (Cappadonna, U-God, and Masta Killa), Rooftop Revolutionaries, Immortal Technique, Brother Ali, A-Alikes, Paul Masvidal of Cynic, Luminaries, Tatiana Moroz, and many more. Keynote speakers include media legend Larry King, Dennis Kucinich, New York Times bestselling spiritual author Marianne Williamson, Ben & Jerry (via video), and David Bronner (CEO of Dr. Bronner’s Magic Soaps). The momentum of the tour will help unite and empower voters and build a base of supporters for young people running for local office in 2014. Our Free & Equal Debate initiatives and Election Assistant app will also help support new candidates for office, especially those running for Congressional seats. Enter your email address to follow Occupy Ventura and receive notifications of new posts by email.